Can You Put a Canner on a Glass Top Stove? John Mason introduced the first commercial canning jars in 1858. He designed the jars from heavyweight, tempered glass to withstand exposure to boiling water or use in pressure canners. Mason jars are made from tempered glass that holds up well to heating and cooling. Boiling water canners operate by submerging the filled jars under water and boiling them and can be used safely for canning high-acid foods. Pressure canners subject the jars to high pressure and higher temperatures and are recommended for both high-acid and low-acid foods. Food in pressure canners requires less processing time due to the higher temperatures. To save on the cost of canning, many gardeners choose to save spaghetti sauce jars for their canning projects. Although they pose no risk to the safety of food, they do have some obvious drawbacks when compared to Mason jars. Reusing commercial spaghetti sauce jars poses some risk of breakage when canning, as the glass is typically thinner than the tempered glass of Mason jars. This means the glass may break more easily when filling or boiling. In addition, these jars are not strong enough to withstand use in a pressure canner. However, some manufacturers now produce spaghetti and pasta sauces in heavyweight jars labeled as Mason jars. These jars hold up well to home canning. Many spaghetti sauce jars feature a vacuum-sealed lid that pops when you break the seal. 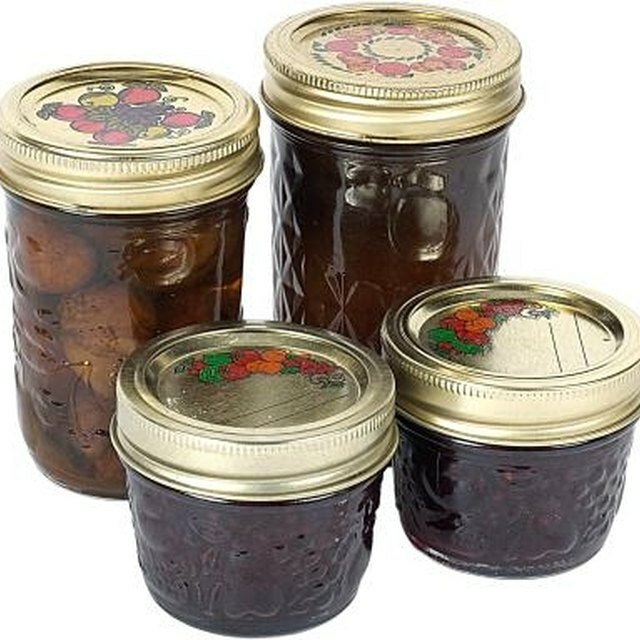 While the lid can sometimes be used a second time for canning purposes, it typically does not seal more than once or twice. Replacing the lid with a two-piece vacuum lid and cap is necessary for canning safely in reused spaghetti jars. The lids and caps can be purchased separately for a few dollars. Spaghetti sauce jars range in size and shape, making following traditional recipes and canning times difficult. Canning times calculated for either pints or quarts, the standard measure for Mason jars, may not be accurate for odd-size jars. Mason jars hold up well in storage, even when accidentally bumped or moved. Reused spaghetti jars may break in handling due to their construction or because they have been weakened with use. Spaghetti sauce jars labeled as Mason jars typically do not pose an issue with breakage. Because traditional canning jars are sold in set sizes of pint, half-pint and quarts, they are easy to organize and store in the pantry. Odd sizes may be more difficult to store conveniently. What Kind of House Is a Duplex? What Is a QualxServ Service Agreement? Are Daybed Mattresses the Same as Twin Mattresses? How Does a Water Transfer Pump Work?